THERE ARE FROCK FLOCKS BUDDING ALL OVER AOTEAROA! CHECK OUT THE TABS AT THE TOP FOR THE FLOCK CLOSEST TO YOU. Some are so new, they haven’t yet made it onto the website, so if you want to know if there’s a flock near you email us! Is your ‘hood currently Frockerless? Do you feel a current of sustainably-minded, funky women in your hometown needing a way to get together, liberate themselves and celebrate biking beauty? Go forth, ladies, and organise yourselves an event! 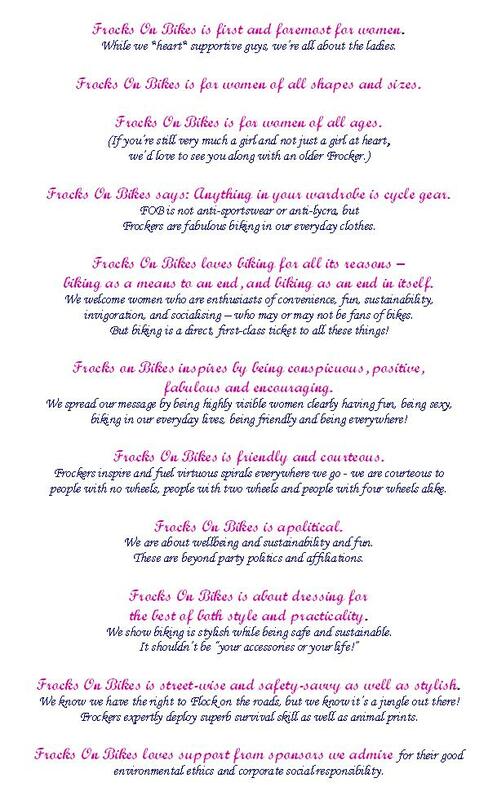 Get in touch and Frocks On Bikes can help you out – we’ve got all the wherewithal to give fledgling Flocks a kick-start – right down to all the e-accessories that make up Frocks On Bikes’ gorgeous aesthetic. You cool with that? Excellent. Now, get in touch already!